Eschenbach Mobilux Digital Touch HD - 4.3 Color Video Magnifier - 3 Hrs. of Battery Use! Eschenbach Mobilux Digital Touch HD - 4.3" Color Video Magnifier - 3 Hrs. of Battery Use! The Mobilux Digital Touch HD (Product # 1651-1) is a new portable video magnifier featuring a 4.3” HD TFT LCD screen with anti-glare coating and LED illumination! 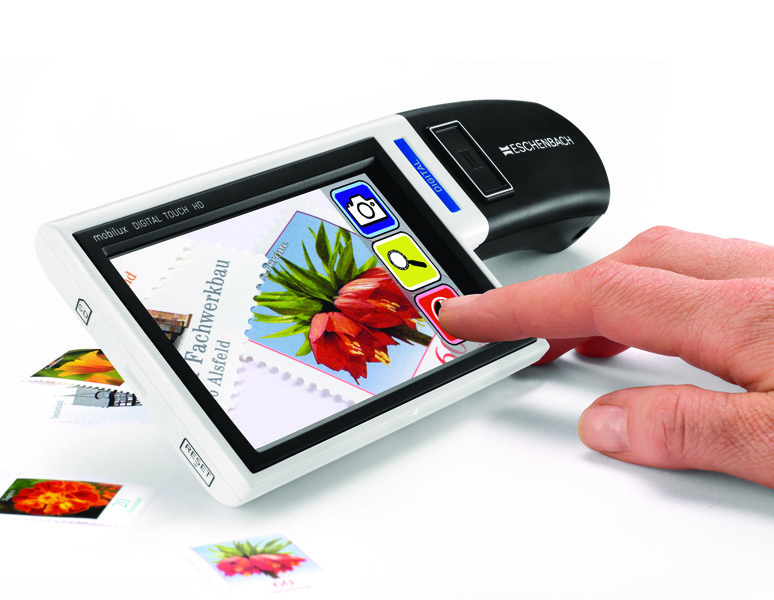 The Mobilux Digital Touch HD has a 4GB SD card that stores photos, which are downloadable to a PC or Mac computer through the included USB connection. When connected to a PC, a live image of what is seen on the Mobilux Digital Touch HD can also be seen on a computer monitor. The run time is approximately 3 hours and the recharge time is 2 hours.